Volume Three - The Pontoon Era - The new pontoon commissioning trials and its early use . . .
'His firm (Swan Hunter Wigham & Richardson) had made a floating dock for Penarth and it lifted about 4,000 tons. Owing to the test ship not having arrived, they tried to lift a 200-ton Russian schooner. 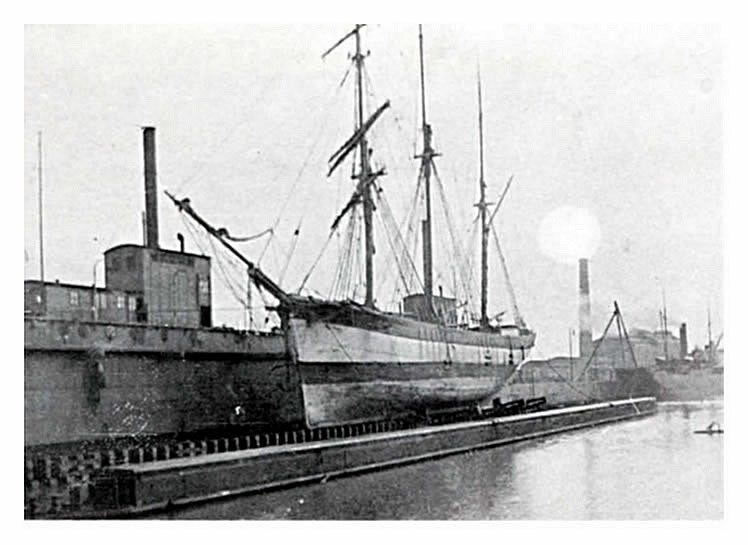 The ship was pulled into the dock and centred on the keel blocks, and when she was about three-quarters of the way up it was noticed that she was slipping off the dock. Subsequently it was found that the ship had a 2ft. bar keel, and it was found that she was not touching the bilge shores at all. The vessel had been pulled into position by masthead tackle. To keep her in position the dock master had put piles of timber in the middle of the long baulk of timber which formed the bilge shore, and the result was that the ship settled on the bilge shores, and the keel was resting on about a foot of timber fore and aft. However, the masthead tackle held the ship until she was properly shored up.' - Journal of Structural Engineers -  - c.1910.